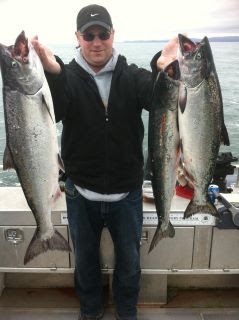 Two fishing reports from FishingSooke.ca members, from Victoria and Sooke. Trevor from No Bananas Fishing Charters was at Constance Bank off Victoria. He reports very consistent action with the best average size winter chinook salmon so far this winter. Best lures were purple haze teaser head and purple haze squirts. Doug from D&D Fishing Charters fished the morning out front of Sooke harbour and then down to the Otter Point trailer park in 110' to 130' depth. They retained 4 fish 24-25", released 3 fish 20-23"and lost two on "long line releases". Doug reports the seal were around, but didn't disturb the fishing today. The salmon were holding 5 feet off the bottom and squirts out-fished bait 6 hits to 3. Most of the salmon were caught going west with the fast tide flow. Doug also reports other boats netting fish and talk on the radio from guys that had fish. It sounds like there's some nice salmon around. On a sunny day without a lot of wind, it's a great way to spend a day. Good luck out there!